One of the most crucial things I’ve been needing for ages is a dagger. It sounds silly, but during combat it’s the best thing if you get disarmed. But it’s harder than it sounds to get an authentic dagger. One of the most annoying aspects of re-enacting the early medieval period is that because not many people do it, there isn’t much demand for it, resulting in getting very disappointed at trade shows. And that’s just for Western daggers. Eastern weapons are even harder to get hold of, but that’s for another post. Basically, I was sick of finding seaxes, and stilleto daggers. So I ordered one off Wieland Forge. Because he knows the group, he knew precisely what I needed. This is the gorgeous result: The picture isn’t great (again, I need a better camera…), but I’m sure you can see how wonderful it is. The problem with getting daggers like this is that everyone wants to decorate the pommel, but the most authentic pommel is a simple disc pommel, with a straight crossguard (many are curved somehow). Just for a sense of the size of it, it’s pretty much a hobbit sword – it’s over a foot long! The braid around the pommel is purely to differentiate my dagger from my fiancée’s otherwise identical dagger. 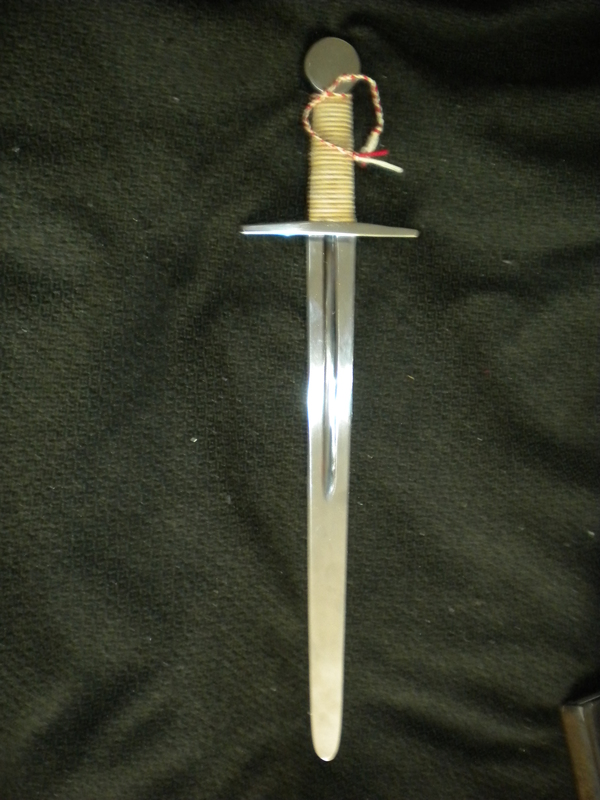 Now it just needs a name and a sheath….